In early March of 1746 Lochiel proceeded, in command of the Camerons, Keppoch MacDonalds and the Stuarts of Appin, to Fort William. They were joined on March 7 by additional Jacobite troops who had "compelled" Fort Augustus to surrender after only a two day siege. The soldiers secured their effects in the woods and subterraneous caverns in the vicinity of the fort, while Lochiel and his fellow officers arranged to use the home of Cameron of Glennevis as their headquarters. There they patiently awaited the siege cannon from Fort Augustus. During this time militia under the command of Clan Campbell continued its campaign of terrorism throughout the region. Entire townships were burned to the ground. During one of these "punitive expeditions" Campbell militia burned some 400 homes along 14 miles of coastline in a single day. With Cameron activities mounting near Fort William these raids shifted more frequently to Lochaber townships, even to lands on Lochiel's estate. 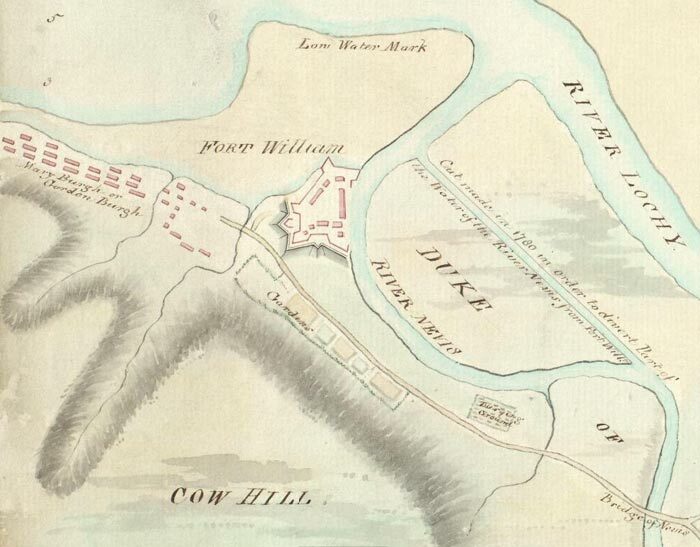 The planned siege of Fort William must have been seen as appropriate justice by the Camerons, since it contained both Campbell Argyll regular and militia units, initially under the command of Major-General Campbell. The single most positive event that happened during this time of the campaign had to have been the return of "The Old Lochiel." While his eldest son had been acting in the name of Clan Cameron, having been given the estates of Achnacarry years earlier when his father went into exile, The Gentle Lochiel was technically "Younger of Lochiel." Within the eyes of his clansmen the Young Lochiel was more than a chief; he was a hero. With Old Lochiel exiled to France, his son had taken his hereditary right and led his people. For a short time Old Lochiel would remain among the people of Lochaber and relive his younger days of military service to the Stuarts. "I cannot omit taking notice that my people have been the first who have felt the cowardly barbarity of my pretended Campbell friends. I shall only desire to live to have an opportunity of thanking them for it in the open field." The siege of Fort William began on March 20 and continued for approximately two weeks. Being supplied and reinforced by Royal Navy sloops of war, which could arrive via Loch Linnhe, beyond the counterscarp and bastions, the fort held fast. The entire realm was intrigued by the siege, as evidence by reports from such periodicals as the Scots Magazine. They withstood the bombardment from the Jacobite field guns, eventually sending a body of men from the fort who took a number of their guns, mortars and shot furnace. The garrison launched a sally on March 31 which destroyed much of the remaining Jacobite batteries. Just a few days later on April 3rd the siege was abandoned. A few Cameron men were captured, wounded and killed at Fort William, among which were Alexander Cameron of Drimnasall, who was killed, and Ewen Cameron, the uncle of Allan Cameron of Callart. He was wounded during the siege and taken prisoner, being sent to Edinburgh. Lochiel and his men remained in Lochaber afterwards, unaware that the Duke of Cumberland was soon to be heading north from Aberdeen toward Inverness, where the Prince and remaining bulk of the Jacobite army had been for the last two months. The Cameron men would enjoy these few days of relative "liberty" in Lochaber, for many of them knew what fate had in store for them. Early on April 12th, having been recalled by the Prince, Lochiel led them on the long march toward Drummossie Moor, near Inverness, otherwise known as Culloden.